To kick off the new year, I have created a 3-part series about developing a personal style. This series is heavily inspired by into mind, an incredible blog I recently stumbled upon that offers advice on how to live a minimalist lifestyle. An important part of minimalism that into-mind focuses on is quality over quantity. To apply this to our lives, we must really understand ourselves. Each piece of clothing in your wardrobe, for example, must serve a purpose and be a color, fit, and style that you really love. Into-mind offers advice on how to hone your sense of style and color so that the pieces you own are exactly what you need and love! 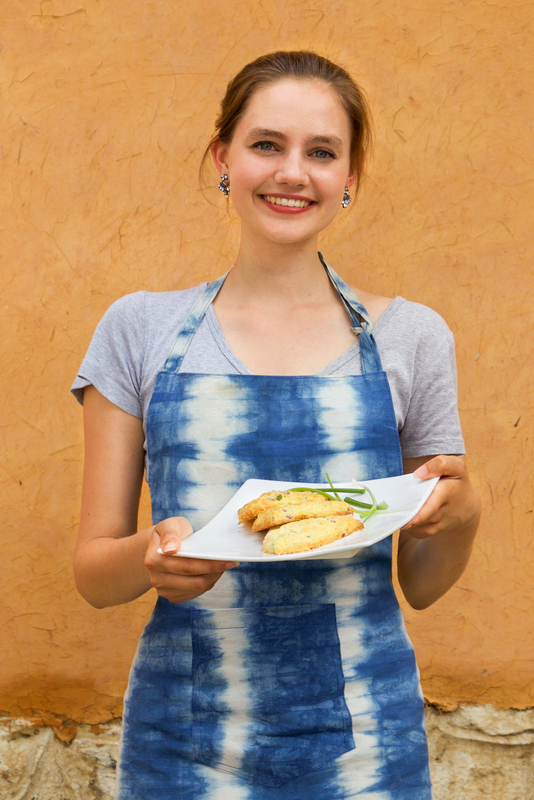 I am going to organize the steps to develop a personal style slightly differently from into mind (see her posts here, here, and here), by going from abstract to more concrete. The first step is my favorite, finding your favorite colors! It may sound silly (shouldn’t everyone have a favorite color?) but you’ll be surprised. 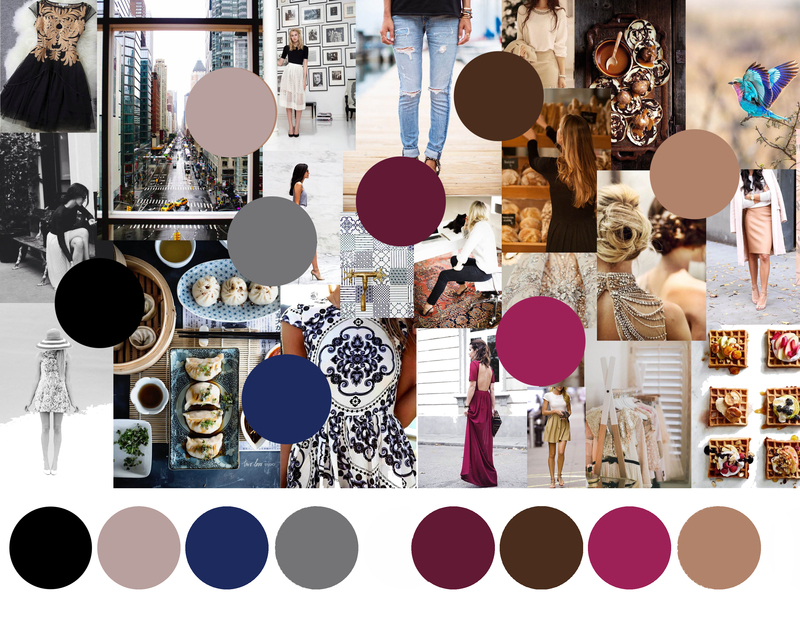 This post will help you create a mood board to pinpoint your exact favorite shades. The first step is to gather all the images and designs that you like. Don’t bother thinking about why you like it, whether because of its color or shapes, just save it. I am a big Pinterest fan, so I scrolled through almost all my pins, “open in a new tab”-ing all my favorite photos. I saved everything from my favorite outfits to color combinations I liked to patterns I thought were interesting. In all, I think I gathered close to about 50 images. Next, it is time to compile all the images. Into-mind suggests that you print out all the photos so you can really see them and play around with all the images, which is definitely ideal, but I didn’t want to waste that much ink so I just did it on an InDesign document. I recommend InDesign instead of Photoshop because the layers can be extremely annoying with so many images! I made my document gigantic to give me a lot of space: 100×30 inches. I organized all the images by color, starting from blacks, grays, and whites on the left to my favorite bright colors on the right side. However, you can organize the images however you feel is best; by mood, individual color, color scheme, type of image, whatever. I recommend first putting the images into sort of piles (like below) and then putting them nicely together later. Embrace the messiness – this isn’t supposed to be a neat and orderly color inspiration board! Once I organized the images, I exported the InDesign document to a .jpeg, put it on a Photoshop document and used the eyedropper tool to take out my favorite colors. Because I had all my favorite images organized by color, it was super easy to see what colors I liked best overall. Each time I found the exact color I wanted, I used my brush tool to “save” it by stamping a big dot of that color near where I found it. Soon, I had my top 16 colors. You can pick more or fewer colors if you want, but I chose 16 because 1, I like so many colors and 2, it is such an easy number! Now it is time to organize the colors that you have found into a nice table (see, it makes sense to have 16 colors, doesn’t it!) And there you have it – your favorite colors! 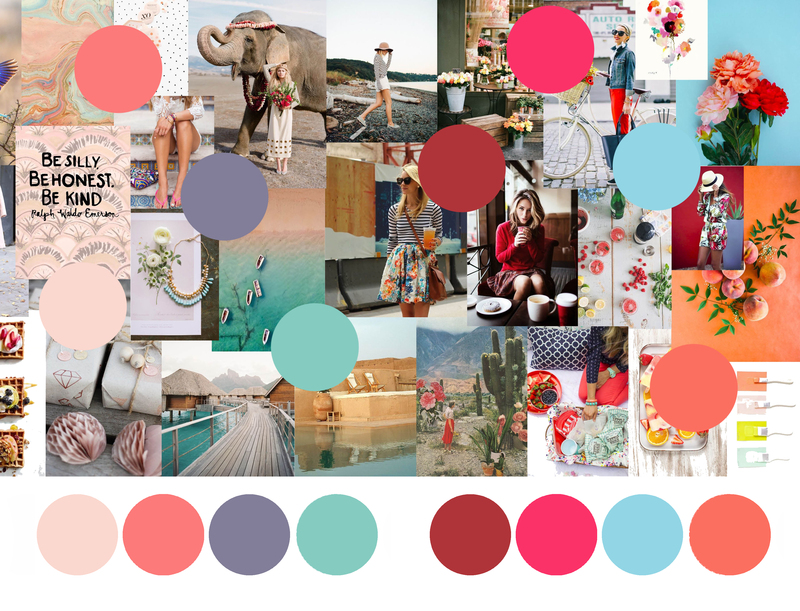 I found that my favorite colors mix and match quite easily, and hopefully yours do, too. I think that they naturally should because you will be drawn to similar color schemes. Stop by next Friday for part 2!